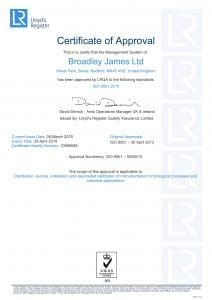 Broadley-James Ltd has successfully transitioned from ISO 9001:2008 to the new International Standardisation for Organisation certification, ISO 9001:2015, a globally recognised international benchmark for quality within an organisation. The ISO framework allows businesses to show that they have consistency, efficiency and productivity within their organisation. The standard is based on a number of quality management principles, including a strong customer focus, greater leadership involvement, a process approach and continual improvement with increased importance given to risk. Broadley-James Ltd is the European HQ for Broadley-James Corporation, Irvine California, USA, a world leader in sensor design and manufacture. Specialising in the measurement of pH, Redox (ORP) and Dissolved Oxygen for bioprocessing and industrial applications.